Taverns and the National Road went hand-in-hand during the early to mid 19th Century. In fact there was a tavern just about every mile along the old pike. A fast stage coach could make 60 miles in one day depending upon weather and road conditions. For the most part travelers walked, some road horses, but the majority of traffic came in the conestoga wagon. These large wagons were usually pulled by 6 horses carrying freight and people along the pike at a speed of 15 miles per day. 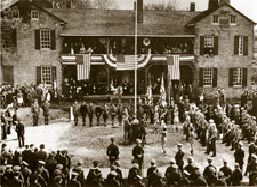 David Snively built a tavern at the end of the National Road and it became a destination for weary travelers including Andrew Jackson and Henry Clay. 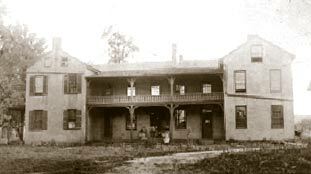 In 1844 Snively rented the Inn to the Funk family who continued to operate the Pennsylvania House as an inn. Over the years the Inn has been bought and sold many times. It was the first historic building purchased by the Clark County Historic Society and was placed on the National Register of Historic Places in 1973. Restoration began in 2005 and after a $1,000,000 face lift, it was re-opened as a National Road Historic Interpretation Center. During the renovation project artifacts were discovered in and around the building as well as the original floor plan of the Inn. Today the 3 story inn stands much as it did a century and a half ago with its 4 porches and 23 rooms. Some of the rooms have been furnished as they would have been in the early periods of the America expansion. Still others have artifacts and exhibitions giving the visitor a look into everyday life along the National Road. A guest can see a doctors office as well as a room for drovers bedding down for the night. There is also a gift shop and general store for the shopper in the family. My grandmother had a jar of buttons and it fascinated me. If you have ever looked into your grandmothers button jar with any sort of wonderment then there is a room here just for you. Grace Porter donated her collection of over 100,000 buttons, some going back to 1734. It is one of the finest button collection in American. There are volunteers here that are more than happy help you make this memorable trip to the Inn At The End Of The Pike. I'll be there... with bells on! Conestoga wagons were traditionally painted blue with an accent color of red used for the running gear. The wagon was covered with white fabric that had been waterproofed with linseed oil. A typical wagon was 26' long, 4' wide and 11' tall and would cost approximately $250. Besides the normal daily necessities like a cooking pan, water kegs, and dried food, it was also the custom to for each of the horses to wear small bells fastened to a leather strap that hung across the horses shoulders. Should a traveler become stuck in the mud or have some equipment break down, it was also the custom of the road for the next wagon to stop and give help if they could. For this help the wagon owner would often give one of his leather belts of bells to the good samaritan. This led to the expression: “I’ll be there with bells on.” Which simply put meant that the person would be arriving as quickly as possible, with no problems signified by the fact that they still had all of their bells in place and none of them had to be given away because of technical problems. David Snively rented the Pennsylvania House to John Funk in 1844. One of Mr. Funks children was Isaac who would spend his childhood in and around the inn which would deeply influence him. In 1876 Dr. I..K. Funk formed the I K Funk Company. In 1890 another Ohioan named Adam Willis Wagnalls joined the partnership and the company Funk and Wagnalls was formed. Dr. I K Funk was a prohibitionist, created the Standard Dictionary of English Language and was heavily influenced by the psychic unseen world of life after death.